In this sociolinguistic study, qualitative interviews were used in examining discursive identity construction among russlanddeutsche Aussiedler. The interview group was composed of russlanddeutsche university students in Germany, differentiating it from much of the previous research. In the analysis, working from a social constructionist perspective, Positioning Theory and Critical Discourse Analytic techniques are used to show how the interviewees 1) construct groups; 2) relate to language; and 3) position themselves in relation to existing discourses in contemporary German society, including instances of resistance to those discourses.§Despite their German ethnicity, Russlanddeutsche are frequently categorized in Germany as ''the Russians.'' In many respects, they have a stigmatized identity in both countries, Russia and Germany, and for this reason represent a particularly interesting group for identity research. 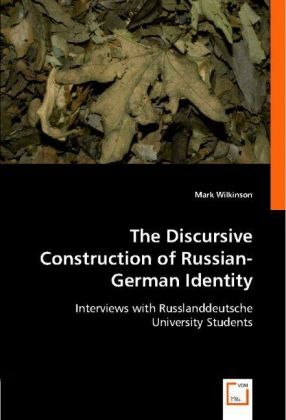 Recent publications, most notably Reitemeier (2006a), have made mention of this ''stigmatized identity'' and also of the fact that many Russlanddeutsche possess hybrid identities. These two concepts, stigma and hybridity, are explored throughout the study.